—Image courtesy of Ted Maksym, United States Naval Academy. Multiyear ice has distinct properties that distinguish it from first-year ice, based on processes that occur during the summer melt. Multiyear ice contains much less brine and more air pockets than first-year ice. Less brine means "stiffer" ice that is more difficult for icebreakers to navigate and clear. Hummocks of multiyear ice that are several years old are fresh enough that someone could drink their melted water. In fact, multiyear ice often supplies the fresh water needed for polar expeditions. First-year and multiyear ice have different electromagnetic properties that satellite sensors can detect, allowing scientists to distinguish the two. For more information, see Remote Sensing in the Studying section. Multiyear ice is much more common in the Arctic than in the Antarctic. This is because ocean currents and atmospheric circulation move sea ice around Antarctica, causing most of the ice to melt in the summer as it moves into warmer waters, or as the upper ocean heats up due to absorption of solar heat by open water areas. Most of the multiyear ice that does occur in the Antarctic persists because of a circulating current in the Weddell Sea, on the eastern side of the Antarctic Peninsula. 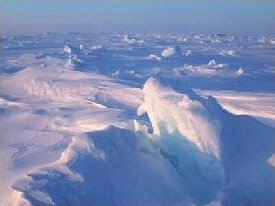 The Arctic Ocean, in contrast, is relatively land-locked, allowing extensive multiyear ice to form.